How many times do you catch yourself looking across a room at someone else, longing for what they appear to have? We compare ourselves to a perception of reality, whether it’s a desire to be thin-boned instead of big-boned, a fashionista instead of fashion disaster, poised and articulate instead of stumbling through our words. We want those well behaved children instead of the ones climbing up the walls behind us. We’d like their square-footage, perfect for hosting fab parties, instead of the coziness of our own humble abode. Maybe there’s a broken heart tucked under that frail skeleton or a health crisis wrapped in designer clothes. Maybe those well behaved kiddos are God’s mercy, because the rest of her life is in chaos. Maybe that lovely, palatial house is evidence of a husband who is hardly ever at the dinner table. 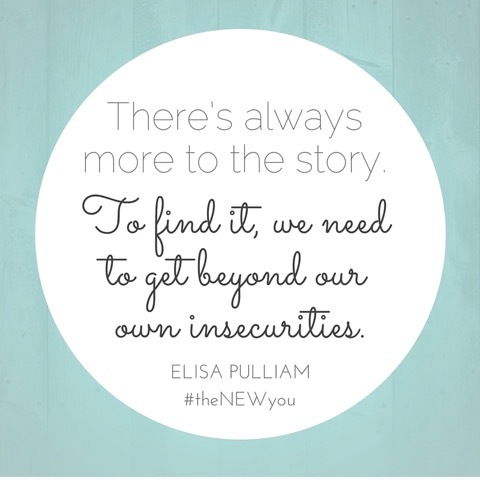 There’s always more to the story — but to find it, we need to get beyond our own insecurities. Chosen. Holy. Dearly Loved. Called. Qualified. Accepted. One of Kind. These words ring through my mind and heart, at least when I choose to drown out the noise of this world and heed the voice of God speaking to me by the power of the Holy Spirit. Only then can I embrace who I am in His sight and all that He has accomplished in me through the grace-giving, life-redeeming, blood-shed-on-the-cross work of Jesus. Oh yes, He made me new at the point of my salvation in college, but that wasn’t the beginning and end of real life change. Over the last decade, God has drawn out the parts tucked away — the parts I thought I could hide from Him — rescuing me from a life of unforgiveness, bitterness, guilt, shame, and insecurity. By God’s grace, and with the help of counseling, the Lord healed me from the inside out as I discovered how to hand over to Him my past and begin to walk in the present in light of the truth. Yes, I was sinned against and committed my own sin — but I was also forgiven by God and called to forgive too. There are two parts to the story, much like how there are two parts to what we perceive others have . . . or don’t have. Friend, when we’re saved-by-grace through Jesus’ work on the cross, we get to live according to life-redeeming truths and not the lie-stained labels the enemy likes to put upon us. We’re not defined by what we’ve done or where we come from, what we have or don’t have. Our worth is not found in how we’re living today. Our identity in Christ, as it is proclaimed in the Word, is the antidote to this battle of insecurity that plagues us. My friend, we need to be cognizant of what we’re saying to our souls so that God’s truth becomes the foundation on which we live. We need to embrace God’s Word as though it has the final say — because it should — in any and every situation, whether we’re the new girl in town or showing up as the old timer. Whether we long to be ten pounds lighter or have resigned that those pounds are hiding in our big bones. Whether we wish our kiddos would behave just a tad bit more civilized or have decided that running around with joy is a perfectly fine thing to do. It’s inevitable — we’re going to look across that room and compare. But how about we commit to taking those thoughts captive and making them obedient to the TRUTH, Christ himself, as we seek to live out our identity in as holy, precious, beloved children of God? 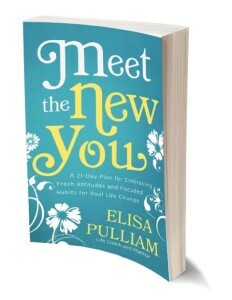 If you’d like to get to move through the process of yielding your heart to God, grab a copy of Meet the New You: A 21 Day Plan for Embracing Fresh Attitudes & Focused Habits for Real Life Change and begin a journey of embracing fresh new attitudes and focused habits that lead to real life change. Elisa Pulliam is passionate about women experiencing a life transformed by God for the sake of impacting the next generation – a mission fueled by God’s redeeming work in her life and twenty-plus years in youth and women’s ministry. 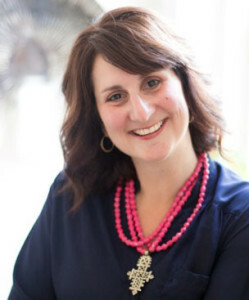 She is the author of Meet the New You: A 21 Day Plan for Embracing Fresh Attitudes and Focused Habits for Real Life Change, a book designed to help women get unstuck as they encounter God personally and put into action biblical truths and life coaching principles relevant for their life today. Elisa is the founder of moretobe.com, serves as the Executive Director of kingdomhearts.us, and tremendously enjoys working as a life coach and coach trainer. However, she considers her greatest roles as wife to Stephen and mom to four amazing children. Connect with Elisa at elisapulliam.com. It is not easy letting go of the life we envisioned to embrace the life that is. But when our life is grounded in Christ, it is always richer and deeper than what we might have imagined. Thank you, Joseph, for your encouraging words — love the visual of “richer and deeper than we might have imagined.” Sings of Ephesians 3:20! Congratulations, Elisa on your book! Thank you for these words of truth to begin our new year. When we look to God’s truth fro comparison rather than our neighbor’s material goods we will always be better off. I wish you much success with the launch of you book. Thank, you, Mary, for your encouragement and blessings! Yes, moving beyond comparison is God’s best for us. Thanks for your wisdom! It sounds like a wonderful book, Elisa 🙂 (and I love your name–our eldest daughter is Laura Elisa). I often fall into the comparison trap, but I’ve been on a journey with God for the last ten or fifteen years to shed my need to compare myself to others…it’s been liberating (yet stressors like moving and new jobs always seem to raise the specter of comparison again :/). Give your daughter a “high five” from me! We’re few and far between with this name! I love how you said “shed” — that’s exactly what God wants us to do — to put off the old self and put on the new. I pray your 2016 is marked by putting on His truth more and more! Thanks for sharing your testimony here on Tell His Story, Elisa. Your book looks wonderful. I just hopped over to Amazon to have a look. May God use it greatly. I love your words: Chosen. Holy. Dearly Loved. Called. Qualified. Accepted. One of Kind. Thanks, Betsy, for your encouragement and support! I’ve got those words posted all over the place, because they are TRUTHS I still need to remember. Thanks for checking out my book, too! Elisa, So much THIS: “We need to embrace God’s Word as though it has the final say — because it should — in any and every situation, whether we’re the new girl in town or showing up as the old timer. Whether we long to be ten pounds lighter or have resigned that those pounds are hiding in our big bones. Whether we wish our kiddos would behave just a tad bit more civilized or have decided that running around with joy is a perfectly fine thing to do.” My one word for this year is embrace…so a fitting word for me this week. It is so easy to get caught up in the comparison game. I will have to check out your book. Tara, thank you for taking the time to share your thoughts. It’s amazing how these words, which I wrote a month ago, are coming back to speak to me today. Wow! God’s cool like that. May we embrace His best for our lives together. Thank you so much, Jennifer, for hosting me here. It such an honor to be in your space of grace and hope, and I pray these words are a blessing to many. Hi Jennifer! 🙂 And great truths to remember Elisa. Congrats on your book! Hi Jennifer! Thanks for swinging by and taking the time to leave a comment! Recently, I’ve felt myself falling into the same traps again in my writing (I started blogging in October), letting myself believe that I needed to seek the rapport from other “clay pots” to have the words God gives me be received…Crazy, considering the progress the Lord has worked within me since reading Jennifer’s Love Idol. But then in preparing to write my last post, the Lord shook me awake with Hebrews 2 and Colossians 3: both about choosing to look to God. I love how Colossians puts it: “HE is your real life” (3: 3, The Message). In being too busy looking to others, I was “shuffl[ing] along, eyes to the ground, absorbed with the things right in front of [me]”, instead of “See [ing] things from HIS perspective” (Colossians 3: 1 – 3, The Message). And His perspective is an eternal, glorious one, in which He is busy working all things together for good…all I need to do is release, surrender and follow the path He’s placed before me. Wow, Anna! I hope and pray you don’t stop writing. The way you weave His word with your insights is compelling. There is a place for you in the writing world — it’s only when we look left and right, instead of upward, that we begin to doubt the work of the Lord in our lives and His purposes. May you embrace His perspective this year, and may I do the same. Thank you so much for your encouragement, Elisa. You’re so right about looking to the left and the right being the problem. My One Word for this year is BEHOLD and already God is using it for good: when I feel myself swaying left or right, I’ve been saying BEHOLD (His face) to myself internally. Love that word! I picture you being held by the Lord all year long! Self talk is so vital to our life in Christ because it speaks to our identity. I think it’s something most struggle with, I know I do. Thanks for the reminder..
Eva, I think we all struggle with our identity to some point. It’s the battle between the old-self and new-self. Thanks be to God that He’s already victorious in that battle. Even if we don’t feel like we are who He says we are, the truth doesn’t change. We are His by faith in Jesus Christ. Praise be to God! Sounds like another wonderful book as we need to constantly remind ourselves to stay rooted in Christ. My list of books to read is growing already this year 🙂 Blessings! Thanks so much for leaving a comment! Yes, Meet the New You is absolutely about being rooted in Christ and not allowing any other roots to take over our lives! If I have learned anything from my 65 years on this earth? It’s “all that glitters isn’t gold”. As Jennifer says, We are PREAPPROVED! and it sounds your book is a great big confirmation of that fact! Love your wisdom, Susan. I need to impress that truth on my girls, who tend to fall into that mindset at their young age. Yes, we are a PREAPPROVED, as Jennifer so beautifully has enabled us to remember again and again. And yes, my book is a big confirmation of that fact — because it’s timeless truth, right?! Elisa, it’s so lovely to get to “meet you” here at Jen’s place. I actually read your book on Mentoring last year and really enjoyed it’s simple, practical approach. — Blessings to you in the New Year and as you continue to press forward into all that God has for you. Lyli, thanks for taking a moment to leave a comment and let me know how my mentoring book impacted you. Thanks for your blessings and encouragement! What a good word! Thank you for this reminder. Thanks for taking the time to leave a comment, Elizabeth! Blessings on you! Elisa, I love this. Congratulations on your book! I know it will be a blessing to many. This is beautiful, timely words! Thank you for sharing! souls so that God’s truth becomes the foundation on which we live.” So true. Thank you 🙂 I look forward to hosting you over at my blog.